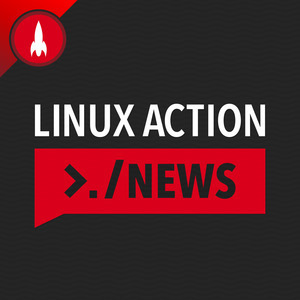 103 episodes of Linux Action News since the first episode, which aired on May 5th, 2017. Asteroid OS reaches 1.0, and Joe gives it a go. GNOME developers consider removing the ability to launch binaries, but punt for now. And the lessons learned from malware in the Snap Store. It's confirmed Linux apps are coming to Chrome OS. Google is finally putting pressure on OEMs to ship security patches, and we try Android of Things. Fedora fights for the user, Ubuntu Flavours draw the line, and why we're worried small distributions are starting to collapse. Ubuntu 18.04 is out and we round up the new features, the flavors, and our first takes. Trisquel has a new release, and Chris tries out the new ReactOS. Plus our thoughts on Microsoft announcing their own Linux, the German government switching to NextCloud, and the fix is in for Gnome Shell's infamous "Memory leak". ZFS' first data loss bug comers to Linux, GameMode could have some serious potential, and Mozilla thinks the Internet is in bad shape. webOS is back, and the Linux Foundation has a Hypervisor for your car. Plus some of GNOME's performance issues, Firefox changes, and the hidden files in Bitcoin's blockchain. Gnome's new tricks, our favorite thing about the Raspberry Pi 3B+, Eric Raymond's call for an open source UPS, and the US city that banned Bitcoin mining. OpenWatch is trying to free your wrist and empower modular smart watches, Fedora's solution to the IoT mess, and more AMP shenanigans from Google to take over the web. Developers are the new gold rush for OEMs and selling Linux is their way to get you to buy. Purism takes big steps to make their laptops more secure, the Linux kernel is ready for lockdown mode, and the new uses for Sailfish just might surprise you. Open Source salvation from Android and iOS gets closer this week, an update on Ubuntu's metrics collection, and huge news for Signal and RISC-V Linux fans. A famous Solaris tool comes to Linux, Firefox is baking in ads, and Google wants to take over the web with AMP. It's week of major project releases, elementary OS gears up for some contested changes, and Mozilla has a solution for the world's IoT mess.